Beautiful sunny weather yesterday for our hunt with old friends and new hunting friends. It was a Brittany trifecta with Angus being the old man of the trio. We went to a now not secret spot that we’d hunted before earlier in the season. 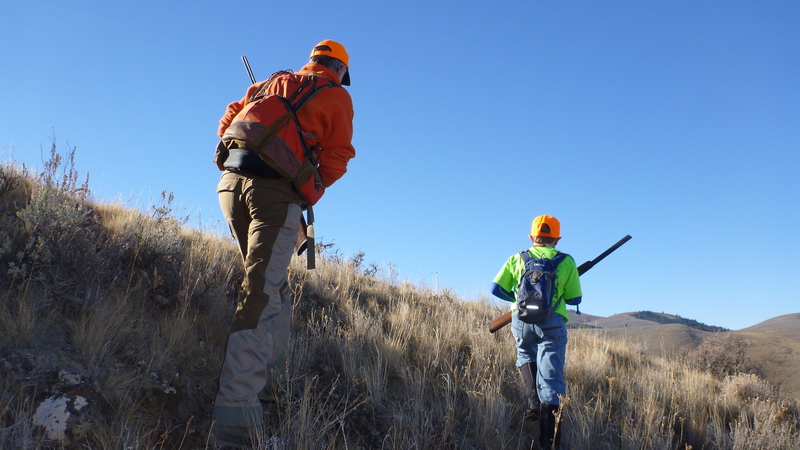 The place yesterday is higher in elevation than our usual spots but we wanted to hunt it before the snow flies since the farmers around here tell us to be prepared for a snowy winter. Angus found and pointed a covey of Huns early in the hunt while the other two young Brittanys were running around playing while honing their own hunting skills in the process. The birds flew with a couple of unsuccessful shots fired. We chased them around a steep hillside until Angus disappeared. Our friend Greg motioned that Angus was down the steep hill pointing. Immediately, a couple of huge blue grouse flew from the tall fir trees and within a second feathers were slowly falling from the sky like magical snow. Surreal. The one Greg hit was so big the dogs didn’t want to retrieve it. We hiked up and down the hills with our hunting party. 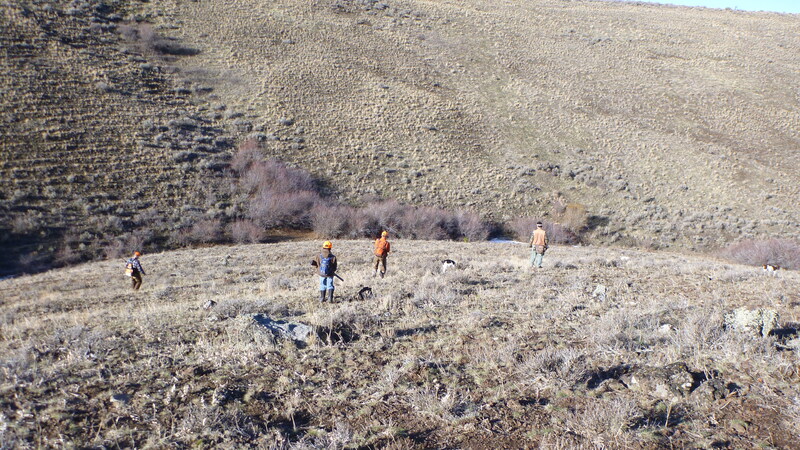 At the end of the day we all ended up with two grouse, two chukar, and a Hun that young Ava found and pointed. 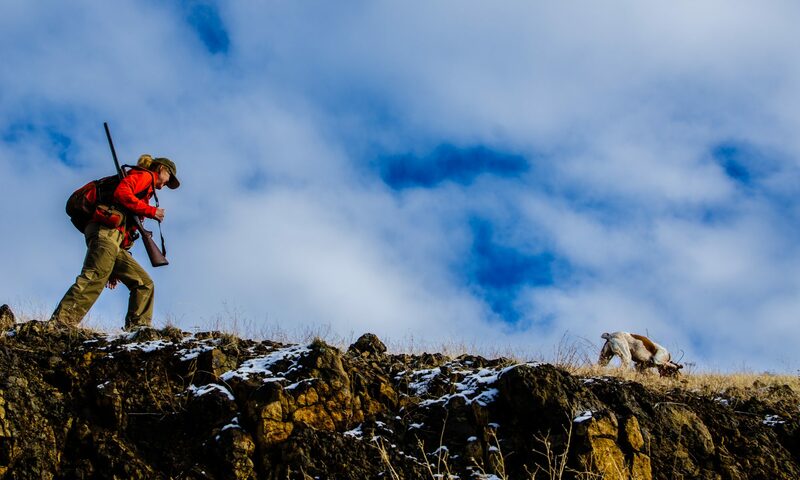 I’d never thought chukar hunting before as a social or group activity, but it was nice spending time in the outdoors with people that enjoy the sport as much as we do. We were pleased that we finally got some birds and had enough to make wild bird risotto for dinner. On the way home we made a very quick stop at the local general store to purchase a few things to go along with it. We left Angus and Ava in the back of the pickup. 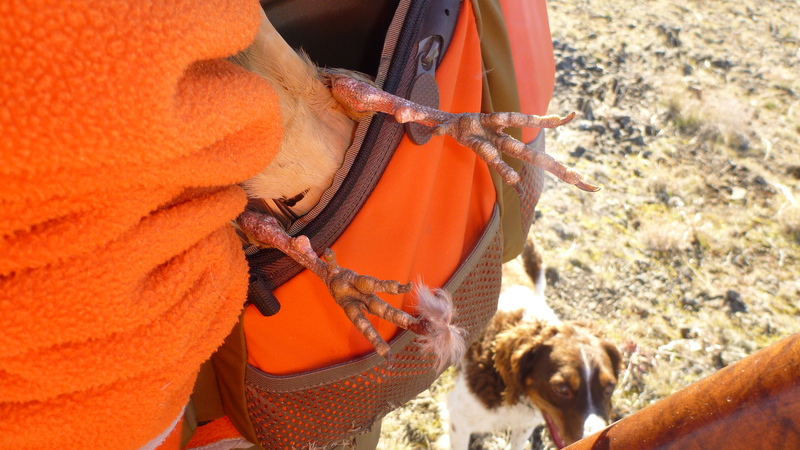 Angus took it upon himself to pull one of the two blue grouse from Bob’s bird pouch and chow down on the breasts and part of a leg within the time it took us to buy a bag of tortilla chips and a couple cans of chicken stock. It was the first time he’s eaten any birds, and the last time we’ll leave him alone with dead fowl. He must have been hungry. 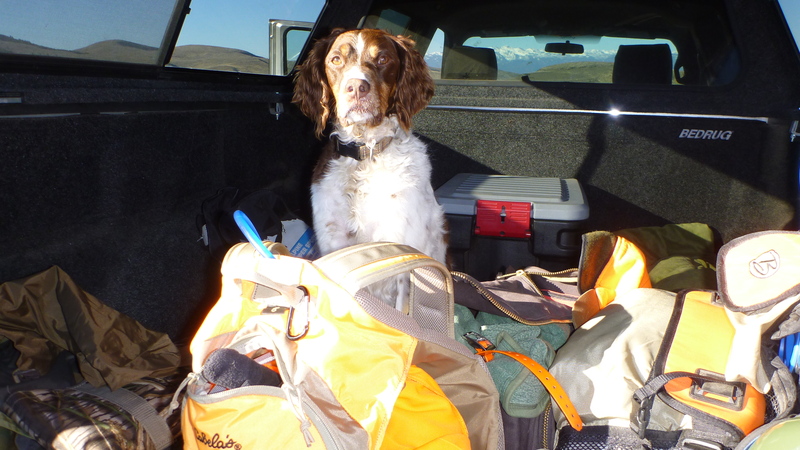 The grouse meat probably served him better than it would have us since he worked way harder than we did. Good dog. Bad dog? Anyway, we had plenty of meat for the risotto and made a wonderful dinner, and had a great toast to thank the birds, dogs, and our friends for visiting. Stellar blog and a fantastic resource. Without revealing any secrets, I’m curious as to what part of Oregon you’re hunting. Central? Far Eastern? Northeast? Southeast? Erik, Thanks for the nice comment. 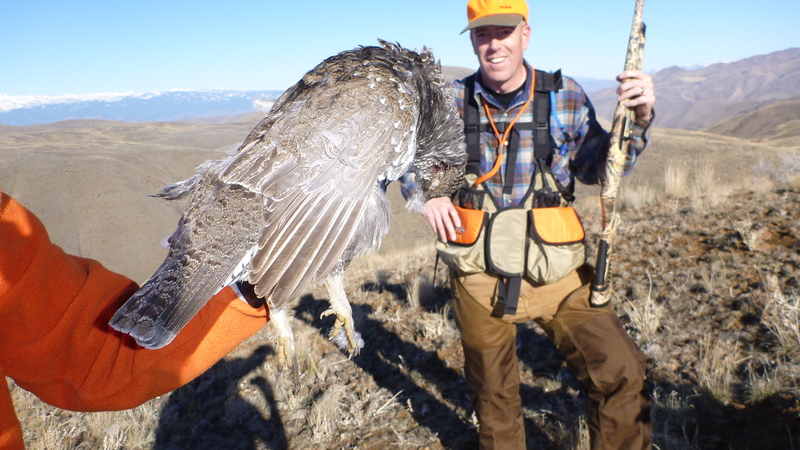 We’re actually hunting in Idaho but very, very close to Oregon. Got it. Thanks. I’m in Bend and have been ranging east and north. Let’s just say I’ve gotten very skilled at putting shells in the gun and then taking those same shells out at the end of the day. But beautiful weather and great landscapes, so no complaints. A little jealously going on? 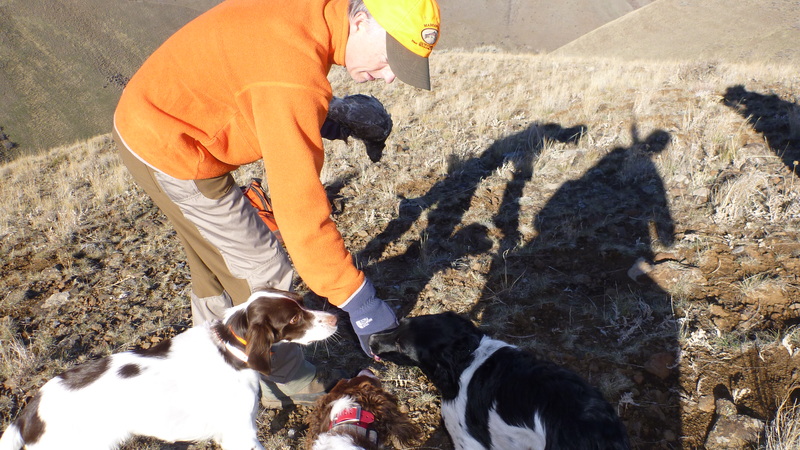 I think Angus might be miffed he had to share his hills, his master, and his birds with other dogs, so he treated him self to that blue grouse to teach you a lesson. Starting to get the same idea, Alan. He is the jealous type. I agree with Alan. A while back your wife got some attention for the hard work she does and also the young man you introduced to hunting. Now, all these new friends and dogs. He had to find a way of getting the camera back on him. I get it – it is really all about Angus!